Scottoiler vSystem is an automatic chain lubrication system that increases chain life by up to 7 times. The system increases wheel performance and saves fuel while reducing the need for chain maintenance. It is also suitable for all chains and motorcycles. The vSystem includes an RMV (Reseivor Metering Valve) control unit, an oil injector (which feeds oil to chains and a toothbrush) and 0.25 l of Scottoiler chain oil, which is sufficient for an average of 4000 km of driving. 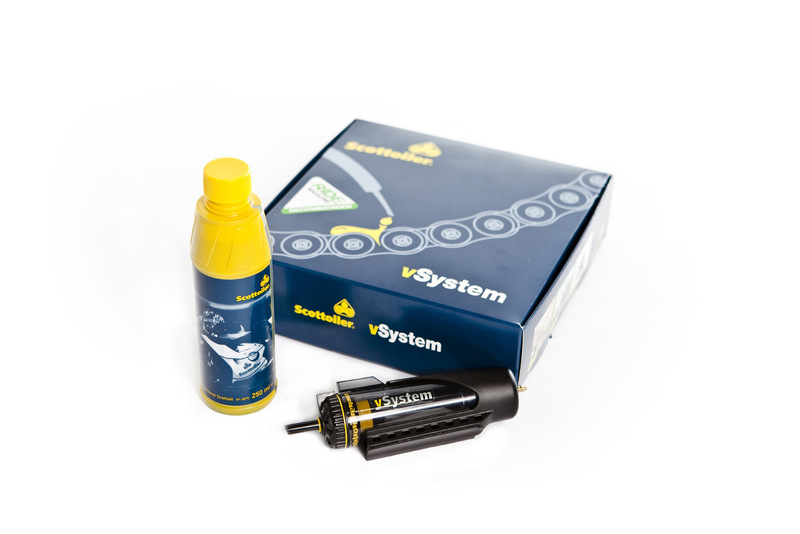 The kit comes with an installation kit that allows the chain lubrication system to be installed on most motorcycles. You can find a detailed installation guide for your bike on the Scottoiler website. The RMV control unit dispenses oil only when the engine is running. The dosing speed of the oil can be easily adjusted from the RMV control unit. One control unit holds 50 ml of oil and drives 800 - 1600 km before refilling.